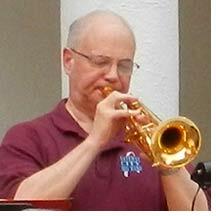 Rick now has the longest tenure of any active Gateway City Big Band member, having joined the trumpet section in 1974. Currently he alternates as the band’s “front man” for gigs with our musical director Stan Minor. During his years with the band Rick has played every chair in the trumpet section, including over 20 years as the lead player, so he now enjoys the variety of filling in wherever needed on the alternate gigs when he’s not leading. He is also the President of the band’s non-profit corporation. 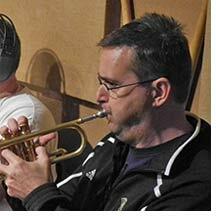 Rick began playing the trumpet at the age of nine in the Riverview Gardens School District. He continued through high school, studied privately and continued playing in college at the University of Missouri-St. Louis where he led the basketball band. After graduation Uncle Sam called, so Rick enlisted in the Army Band where he served in Stuttgart, Germany. Less than a year after returning from Germany he was invited to join Gateway, and he’s been active ever since. Rick is a retired banker and has one son, Doug, a piano, clarinet and sax player, who has subbed with the Big Band over the years. Doug is a Captain with the United States Army and currently resides in Manhattan, Kansas with his wife Susie and their two children. In 2005, Rick and trombone section leader/vocalist Karen Kelly Sharp were married. 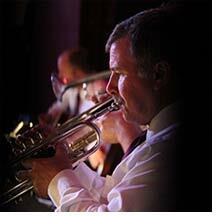 The return of the popularity of big band music has Rick thrilled as he notices the crowds getting younger and younger. Rick sees a real future for big band music, a passion he has had for over 50 years. Sandy filled our jazz trumpet chair in the fall of 2014. Originally from Kansas City, Sandy made the move to St. Louis and graduated from Park-way West High School. His next stop was the University of Tulsa where he got his BS in Electrical Engineering. He’s currently a software engineer. Sandy and his wife, Wendy, have two grown children, Maddie and Hallie. Dan was born and reared in St. Louis and went to Lindbergh High School, graduating in 1981. He played trumpet most of his life through high school and college, playing in the jazz band in college. To keep his chops up, Dan worked with German bands and did lots of church and wedding gigs. He also plays bugle with the military honors program, mainly at Jefferson Barracks. He goes to Cardinals and Blues games and is a member of the Greater St. Louis Area Council Camp Staff Alumni of the Boy Scouts. He works as Chief Information Officer at the Veterans Administration office in St. Louis. Fellow Lindbergh alum Karen Sharp recommended him and he’s been on the band since January of 2011. He said that it was stressful at first because he had not played jazz in 25 years, but it was good to get back into playing this music. Dan is married to Laura Rohlfing and has a son and a daughter. 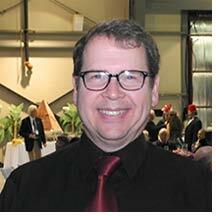 Bill is a sports medicine doctor with a love of music; he joined the band in the mid-90's because of his love for the big band sound. Bill was born in Tulsa, Oklahoma and began playing trumpet in 6th grade. In the high school band he was voted "Most Outstanding Senior." In addition to junior high and high school bands, he played in a city-wide band called the Young Tulsans. He toured with this group, playing in Romania, England and Sweden, as well as throughout the U.S., Canada and Mexico. Bill took his horn with him to Drury College, playing in the Concert Band, Jazz Band and Orchestra. While he was in medical school at Oklahoma State in Tulsa, he continued playing in community bands. When Bill moved to St. Louis he took time off from music for sports medicine training, but in the early 90's joined the Meramec Concert Band and the Ambassadors of Swing, where the Gateway City Big Band got his name and called him to be a substitute. He finally was able to alter his schedule to come play and when a spot in the trumpet section opened up in 1998, he became a regular. Bill is married to Julie, who he met at the Muny Opera. They have two children, Sara and Max. The kids will grow up with the Big Band as Bill has no plans to leave anytime soon. "I will stay with this group as long as they let me," he says enthusiastically. Bill likes Gateway and its members. "It is one of the best and most fun bands I have ever played in," he says. He fits right in!